It may seem like an eternity away but, with the best part of the winter behind us, warmer weather will be here in no time. To be quite honest it has been a bit of a freak winter – with average temperatures well up, it’s felt more like an extended autumn here down south and a lot of venues have continued to do bites to those who have stuck it out. Despite the Carp being more active than usual they will still be in a much more lethargic state due to the cooler water temperature so, regardless there will always be a ‘mad’ spell of activity in the early part of the year when temperatures begin to rise. This is one of my favourite times of year to be on the bank. It’s not only a refreshing change from the dismal weather the winter deals us, but the fishing can be some of the best of the year. More often than not, this is the time when the real ‘clued up’ biguns will let their guard down just enough to make a capture a realistic possibility. There are also spells when the rest of the stock adopts an almost suicidal attitude and some real big hits are possible if you can manage to be in the right place at the right time. Even if your target lake has a closed season in the spring, from the last weekend of February onwards there can still be a really good window of opportunity available if the weather picks up nice and early. In this article I’m going to run through a list of hints and tips to help you prepare yourself for the warmer weather and hopefully make the most of the fishing that’s on offer. Watch the weather – in my experience the main trigger for the Carp waking is the sun. Not just daylight hours but the first bright, warm, strong early spring rays. The first time you can stand outside, take your jumper off and think ‘that’s nice will probably be the first time the fish are thinking the same. Keep an eye on the long range weather forecast and make sure you are on the bank. Keep your eye out for the classic big low pressures with strong warm winds, as they will also be a big trigger – these tend to be less common this time of year but you never know. Keep your eyes peeled – it’s always important to keep your eyes on the water – now more than ever. That one show in an area of the lake could be the first sign that they are waking and you need to be the first to see it. Very often Carp shoal in big groups this time of year and seeing one fish will probably mean it’s with a whole lot more. It’s not always a blatant show either. On numerous occasions I have found large groups of Carp milling about in areas just under the surface. 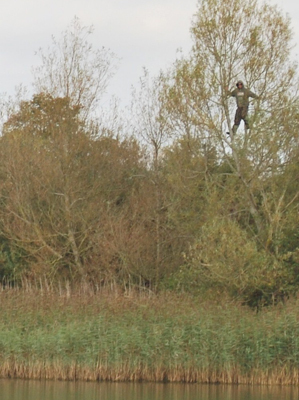 Get your Polaroid’s on, walk round the lake and climb trees! Be mobile – now is not the time for hanging around and sitting it out. Even if you think you know the lake like the back of your hand, the Carp can be quite unpredictable at this time of year and can literally pop up anywhere. Keep your tackle minimal and as light as possible. The last thing you want is to be so laden with gear that you either can’t be bothered to move or you get beaten by someone else who has also spotted what you have, even if you are on fish one minute they can be off again in no time. Zigs – zigs have become a bit of a craze in recent years, but not without good reason. They are a devastating alternative way of presenting a bait to a Carp. Without question the zig comes into its own at this time of year. 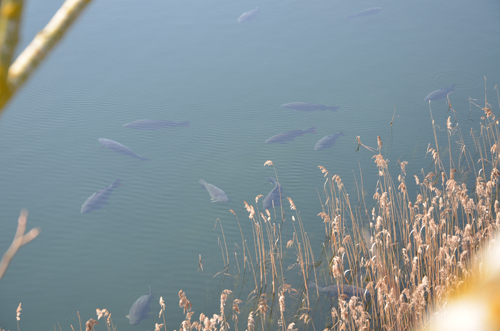 The Carp will be spending the majority of their time cruising around in the warmest layers, normally in large groups. If there are more than a few feet of water beneath them then it is almost pointless having a bottom bait out. A small piece of foam or trimmed down pop-up right up in their face is a lot more likely to be taken. It’s not just the Carp waking but a whole range of aqua life the lake is home to. Everything in the lake will be stirring, kicking up bits and pieces off the bottom. Insect larvae will be hatching and the fish will be on the lookout for this big time. Again, other baits and rigs will normally be completely overlooked if Carp are on natural hatches. 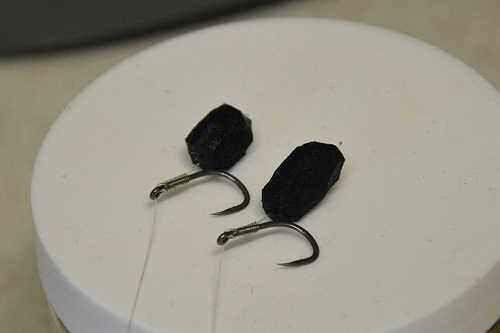 There is no better bait at this time than a small piece of black foam on a zig. Keep a close eye out for larvae crawling up from the waters edge during your session to indicate a hatch taking place. Also keep an eye out for the birds – Seagulls, Swallows and Ducks all love feasting on the insects and can normally be seen taking advantage. If you are not on fish, it can always be worth a move onto an obvious hatch. Go easy with the bait – there will be occasions when they will be well up for a feed and will take everything you give them but don’t go in to heavy to start. Single hookbaits and PVA bags are more than enough for a bite if you are casting at fish or areas, and if you are fishing in close a few handfuls will suffice. Firstly, the Carp will not always be in a heavy feeding mode so every item is one less chance your hookbait will be taken. Secondly, if you need to move it is much easier to walk away from a swim if you haven’t just filled it in. Lastly, with there being no weed for the fish to take cover in its worth keeping disturbance to a minimum. The last thing you want to do is find them, start spoding or catapulting a ton of bait out, sit back and find they have done the disappearing act. Go bright – colour can be a very big edge this time of year and bright pop-ups can really come into their own. 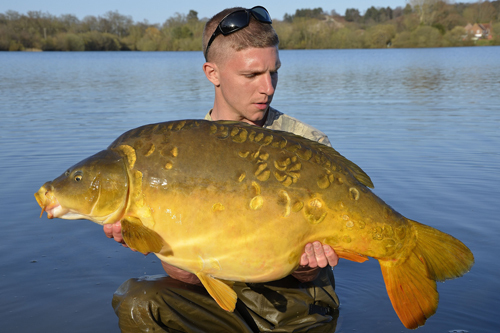 The lake bed will be largely baron and silty, so the contrast of a bright single will be easily spotted by a passing Carp. So that’s my top tips for late winter / early spring. By fishing in this way it has been a great season for me in recent years and there is no reason you can’t replicate it yourself. Get out, put the effort in and enjoy it! This entry was posted in Techniques and Methods and tagged carp fishing, carping, carping tips, Matt Jackson. Bookmark the permalink.